“I think a lot of us feel like we’re too damaged or no good, like there’s not enough forgiveness for us,” says Stephanie Rich, an inmate of Whitley County Jail in Columbia City, Ind. Rich has been at the jail a long time, and she knows a thing or two about being brought low. 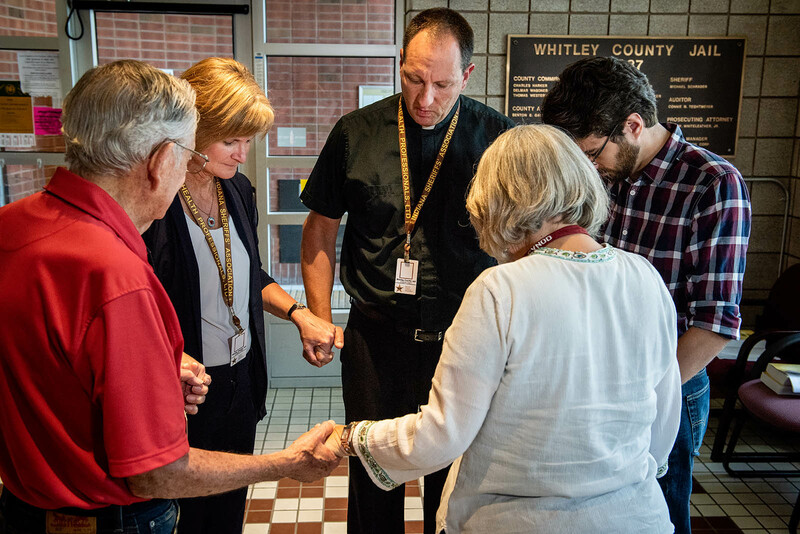 But in the midst of her troubles, she met the jail ministry team from St. John Lutheran Church, Columbia City, and started to wrestle with questions of faith. As she attended the weekly Bible studies and semimonthly services, Rich says she progressed from an atheist to an optimistic agnostic to a Christian. Now, when Rich thinks about “how large God’s grace really is,” it brings her to tears. Watch a video about the jail ministry in Columbia City, Ind., through the eyes of an inmate and the church workers who are serving the community. Seventeen years ago, an elder at St. John encouraged the congregation to begin a jail ministry program. That’s when the Rev. 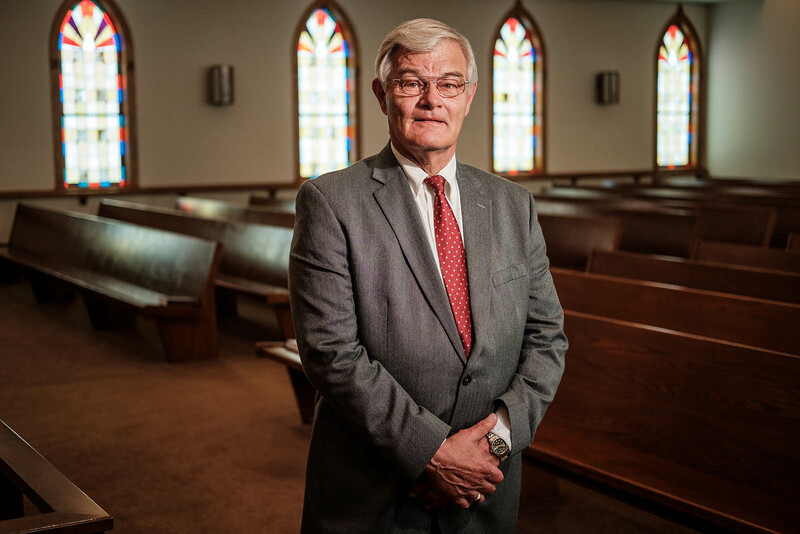 David Mommens, pastor of St. John, sought permission to sit at a table and offer Bible study in the men’s cell block of the local jail. Over time, other people from the congregation and the wider Lutheran community joined him. One of the church’s field workers from Concordia Theological Seminary, Fort Wayne, became interested and asked to come along. He went back and told his classmates, and soon other seminarians — about 25 over the years — were coming to get hands-on experience. Later, Mommens received permission to take deaconess students and female volunteers into the women’s cell block, where they would eventually meet Rich. Deaconess Carole Terkula from St. John Lutheran Church, Columbia City, Ind., hugs Nan Harman, a woman going through the mentoring program. “Miss Carole makes me feel safe. She makes me feel worthy. She answers any questions I have about anything I read in the Word. She lets me just talk,” Harman says. One of those deaconess students was Carole Terkula, who came to St. John two years ago as a deaconess fieldworker assisting with the jail ministry. This past year, she also served her deaconess internship at the church and took on more responsibility for ministry in the women’s cell block. After finishing her studies this past spring, the church called her as a deaconess to continue working in this capacity. 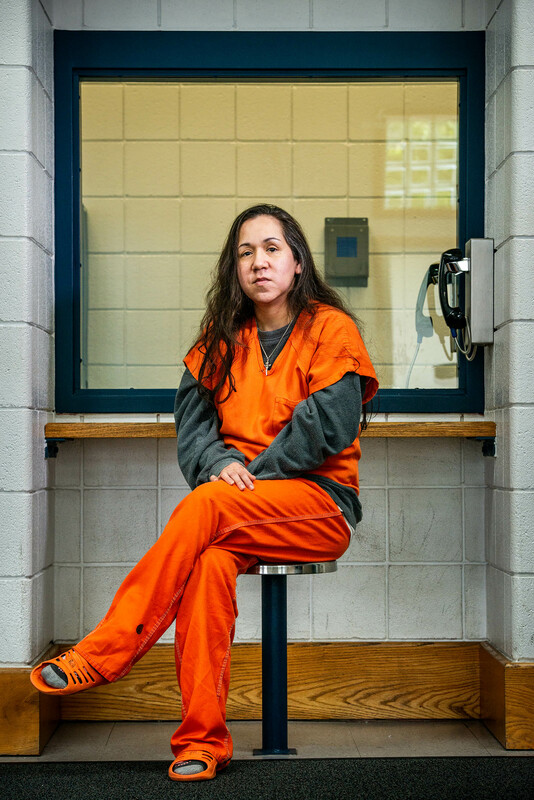 “For me, part of the joy of jail ministry is really seeing the power of God at work,” Terkula says, as she describes how she’s seen God’s Word work on some “pretty rough and tough” people. “I remember the first time that Carole and I walked in for Tuesday evening Bible study and that door slammed behind me. I think I jumped,” says Diana Rainer, a member of St. John who volunteers with the jail ministry. Like Rainer, many volunteers are nervous at first. There is a lot to learn, and there are many restrictions on what can be brought into the jail. But soon, that fear fades and the incredible opportunity to share Christ takes center stage. (Clockwise, from left) Deaconess Carole Terkula and Vicar Mike Terkula of St. John Lutheran Church, Columbia City, Ind. ; seminarian Adam McDowell from Concordia Theological Seminary, Fort Wayne, Ind. ; and volunteers Diana Ranier and Carroll McNutt pray before Bible study inside the Whitley County Jail. Only a couple of inmates may show up when a Bible study starts, but by the end a group has gathered around the table and people are actively asking questions about what they’ve heard. Mommens and Terkula usually don’t know why the inmates are in jail, and it doesn’t matter to them. “To me, Stephanie is just another child of God,” Terkula says. Captain Sean Martin, jail commander, has observed the ministry since its beginning. “Some people use church time to take advantage of making relationships with other people or talking to people. But there are people that are there and they want to learn and benefit from what that service offers them,” he says. The Rev. David Mommens at St. John Lutheran Church. The U.S. has a high rate of recidivism — the U.S. Bureau of Justice Statistics has found that 68 percent of released state prisoners are arrested again within three years. This staggering reality has led St. John to expand ministry to the work release program and Mission25, a local homeless shelter where inmates may go upon their release if they don’t have a safe living situation available. Several months ago, Terkula also started working with Mission25’s mentorship program for residents. That’s how she met Nan Harman, a woman who served a prison sentence in Texas and participated in a prison ministry there before moving to Indiana. Harman is currently living in the homeless shelter while she works to build a new life for herself, and it’s helpful for her to have a friend and mentor in her new community. 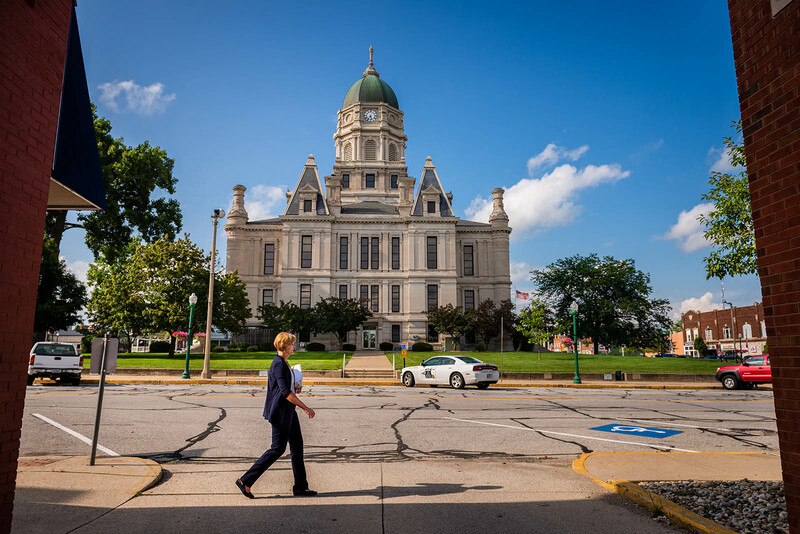 Deaconess Carole Terkula walks to the Whitley County Jail for Bible study. But change doesn’t come easy, and there are often setbacks and disappointments. Even Rich admits she still struggles with doubts about God and His Word — something she was afraid to say out loud at first. But through the jail ministry, she learned about the Bible story of the father whose son had an unclean spirit. Like the father from Mark 9, Rich now prays, “I believe; help my unbelief!” And by grace, God gives her that faith through His Word, thanks to those who serve. Heavenly Father, Your Son taught His disciples to visit those in prison and to love the captives. 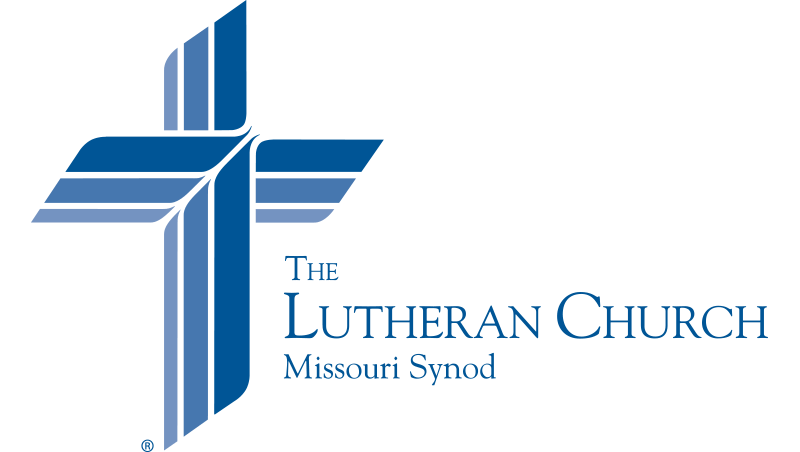 Bless the work of St. John Lutheran Church and all those who serve those incarcerated. May Your Word bear fruit through Your servants, that all might hear and trust in Christ for forgiveness. Be with those who have been released from prison, and lead them from temptation to live lives in service to community and neighbor. Teach all of us to so live in Jesus Christ, our Lord. Amen.